September 19, 2013 banking, budget, Dollar, Economy, Wall St.
Bad news for the economy is good news for Wall Street these days. Yesterday Bernanke announced it was too early to taper off on his greenback spinning wheel. 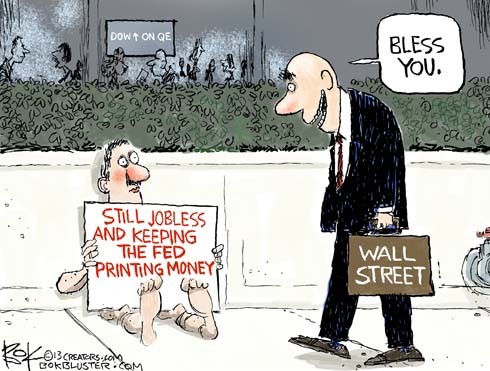 He’ll continue to pump $85 billion per month into the sluggish economy through quantitative easing. The magic money is conjured up when the Fed buys Treasuries and mortgage backed securities. The sorcerers on Wall Street were pleased and stocks hit record highs.